Moonlight filters through a bower of jasmine, beautifully interpreted on a hand-carved vase. 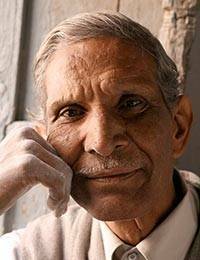 Working in natural soapstone, India's Gulam Rasool demonstrates the traditional art of jail or openwork carving. 25 cm H x 9.5 c m Diam.